At 8 a.m. this morning, a construction worker fell two stories from scaffolding on the Domino Sugar factory site, 335 Kent Avenue, in Williamsburg, Brooklyn, near the Williamsburg Bridge. The former factory is currently being converted into affordable housing backed by New York City and designed by SHoP Architects with developer Two Trees Management. 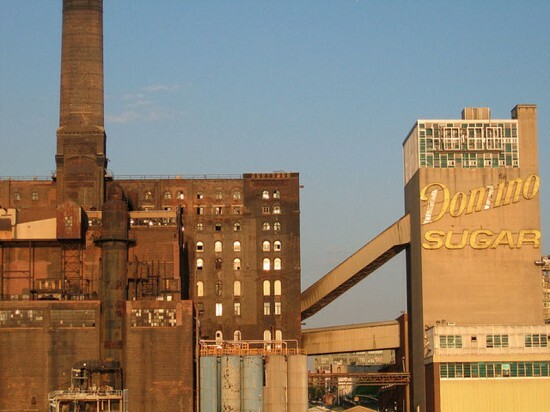 The Domino Sugar factory site is an open worksite, although union workers have performed specialty tasks onsite. This is the 11th construction worker death in the city this year according to the Department of Building. The majority of the construction worker deaths that took place last year were also on non-union worksites. The City Council is currently working on new legislation that would make worksites safer and the process of reporting injuries and fatalities more accurate. Now, a special session regarding this legislation has been called before the year’s end. Slated to open in 2018, the Domino Sugar Factory building will have a total of 500 apartments, 105 of which will be affordable units. The redevelopment will be a total of 600,000 square feet and will also include office space, ground-floor retail, terraces, and an open plaza, as well as access to the waterfront, a new five plus acre park designed by James Corner Field Operations, and a new ferry landing. The former factory is an exterior landmark, so the 19th-century redbrick facade will remain unchanged. However, new “industrial luxury” amenities will be used throughout such as exposed brick, ceiling beams, will define the interior spaces.